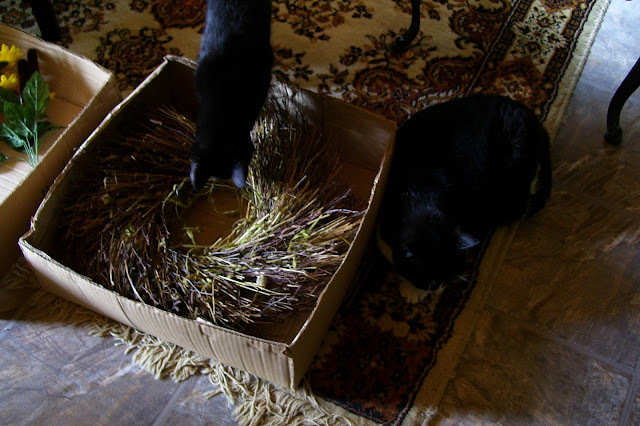 It's All Connected: The Wreath Started It! It all started with an old wreath that had definitely seen better days. I've used it off and on for years outside. Birds loved it! They used it like a bird Home Depot and took whatever materials they needed for their nest renovation projects. One lazy clever bird built her nest right in the wreath! I suppose she found that easier than hauling it all off to another site. Since I'm practising thrift, gift, reworked and found this year, I thought I would give it an overhaul. Then, they both started eating it. Like this wreath hasn't had enough abuse? Everything I tried as trim looked odd on such a mangled simple wreath so I decided to go with something as understated as a bow. 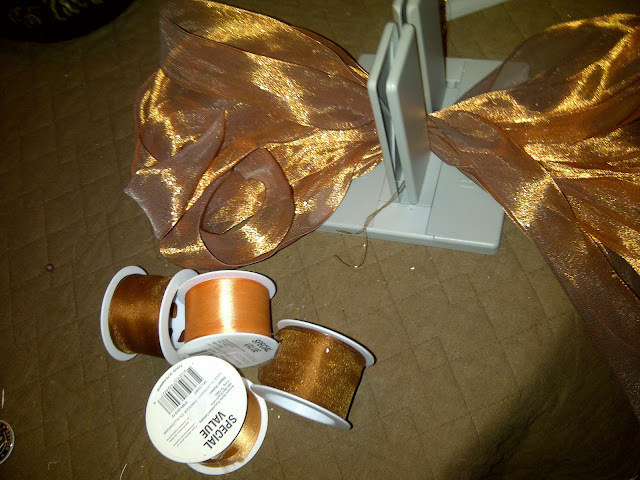 I had three small rolls of wired ribbon that I picked up at Michael's for $1.00 each and a large roll of ribbon that I picked up somewhere for under $5.00. Several years ago, I bought a Bowdabra at Michael's for $17.00. That seems like a lot of money but I've used it a zillion times decorating client homes and tour houses at Christmas. I also have the most excellent bows on all my gifts! You have to get one of these things! It's easiest to spool all the ribbon off the roll. I started with the large roll, moved on to the two small rolls of brown and used the orange roll for the centre, decreasing the size of the loops as I went. It was wired to the wreath with florist wire (another essential for seasonal decorating) and I tucked four dollar store silk maple leaves in behind it. The total cost was $9.00. That led to washing the siding, window cleaning, cornstalk cutting and a general frenzy of filling baskets with pumpkins, grapes and flowers! And, that's just the start of what I will put myself through this season. It's all okay, though, because this is my very favourite time of year to decorate! Decorator tip: When working with outdoor spaces, you need to "go big or go home". This is going to be viewed from a distance and little things just look like clutter. Fifty little garden ornaments don't have the impact of one large one. If it's going to be a bow, make it as large as you can! Try not to envy my undersized, corroded exterior light. I want to have the porch made into a sun room and the light fixture will become redundant. In the meantime, I simply don't look at it. ps ~ Since you all liked the wreath revamp so much (thank you) I put it on the linky party at No Minimalist Here. Great site! I can't wait to see what you design for a Halloween wreath! Maureen, What a pretty porch! The ribbon you made for the wreath is fabulous..I'll be looking for a Bowdabra now. Thanks for linking to the Open House party and have a great week. Thanks Sherry. I'm so honoured to have a blogger of your caliber following! I'm blushing!